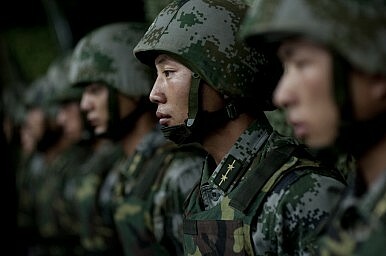 China’s defense spending is set to double by 2015, says a new report. What does it mean for U.S. ties? China’s annual defense budget is set to double by 2015 and exceed that of all other major Asia-Pacific countries, according to figures from leading defense consultancy IHS Jane’s. The numbers, which were sent through to me this week, suggest China’s defense budget will soar to $238 billion – more than the next 12 leading Asia-Pacific countries combined, and four times that of second place Japan, which will be spending an estimated $64 billion. Chinese Vice President Xi Jinping is finishing up a five-day visit to the United States this week, a trip undoubtedly aimed in part at mollifying U.S. concerns over its rise and presenting a friendlier face (although holding this face won’t have been easy, with Xi receiving the expected election year scolding over playing fair and human rights). All this ties into the latest defense figures because an increasingly powerful Chinese military may become more emboldened to assert its claims more “robustly.” This is a point picked up by American Enterprise Institute scholar Michael Auslin writing in The Diplomat yesterday, who notes potential lessons from the fall of Singapore back in 1942. So, is a pumped up Chinese military budget an inevitability that China’s neighbors – and the United States – will have to learn to live with? Not necessarily, according to Flashpoints contributor Trefor Moss. This is unlikely to mean that China’s defense budget is actually cut – it would take more than the global economic slowdowns to make that happen. But with Europe struggling to get its economic act together, and with the United States’ economic recovery still fragile, the possibility of China having to slow defense spending certainly can’t be ruled out. The ongoing row in the South China Sea highlights China’s inability to compromise. Why won’t it?